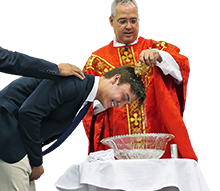 On the eve of its 120th school year, Jesuit High School celebrated a most historic milestone on Tuesday (August 7): The Rite of Dedication for the Chapel of the Holy Cross. Bishop Michael C. Barber, S.J. of Oakland, Calif., the first American Bishop appointed by Pope Francis, was the celebrant of this joyous occasion years in the making. 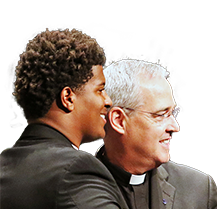 Jesuit priests, along with dozens of Jesuit student altar servers, chamber musicians, and choir singers, as well as hundreds of Jesuit High School supporters, joined the Bishop at this momentous event. Now consecrated, the magnificent 950-seat Holy Cross Chapel – the heart of the school at the center of campus – represents the fourth major sacred space in Jesuit's history. It is preceded by St. Louis Church (1899-1905), Sacred Heart Church (1905-1962), and St. Anthony's Chapel (1962-2016). 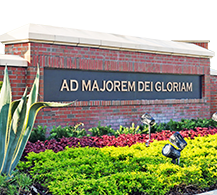 Featuring the captivating works of Spanish painter Raul Berzosa and Florence, Italy-based sculptor Cody Swanson, the new student chapel will serve the greater Jesuit community and boys in the Tampa Bay area for the 21st century and beyond. Tuesday's special event began with a beautiful processional from the south end of the gymnasium. It moved north past Faber Hall and then west along the south side of the chapel before finishing at the Chapel portico. There, the Chapel's architect, Duncan Stroik of the University of Notre Dame, and Taylor Burt '08, representing contractor Batson-Cook, offered the keys and the plan to the building to the Bishop. Jesuit school president Fr. Richard C. Hermes, S.J. then unlocked the doors to the chapel and led everyone inside. The Bishop, accompanied by assisting priests including Fr. Hermes, S.J. and Jesuit High School's Fr. J. Patrick Hough, S.J., Fr. Paul Deutsch, S.J., Fr. Vincent Capuano, S.J., Fr. Angel Rivera-Fals, S.J., and Fr. Jay Hooks, S.J., led the ceremony. He sprinkled the people and the walls with holy water all throughout the chapel. Six authentic relics were part of the processional (they had been venerated in the gymnasium) and Bishop Barber placed one in an aperture at each of the four side shrines, and two in the main altar. There, they were enclosed by a stonemason. Before pouring the sacred Chrism and anointing the altar, Bishop Barber said: "May the Lord by his power sanctify this altar and this house, which by our ministry we anoint, so that as visible signs they may express the mystery of Christ and the Church." Tuesday's inaugural Mass (click here for the Mass program) inside Holy Cross Chapel was in memory of Fr. Michael Kennelly, S.J., who was president Jesuit in the 1950s and spearheaded the school's relocation to Himes Avenue in 1956. The Mass was dedicated in honor of Marjorie Couch, mother of Ted Couch '54. 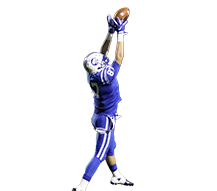 Couch made the largest gift in school history, $3.15 million, to Jesuit's 'For Greater Glory' campaign. The chapel of the Holy Cross is the second major structure supported by the $40 million campaign. 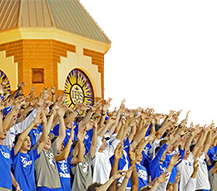 Launched in 2015, 'For Greater Glory' represents a renewal of school life by investing fully in Jesuit's people, programs, and facilities, and the campaign includes both Phase I and Phase II of the school's campus master plan. Phase I has included Gonzmart Hall, a 32,000 square foot administration and student center that was dedicated in March, and the stately Oliva Courtyard. The courtyard connects Holy Cross Chapel with Gonzmart Hall and will be completed in the coming weeks. (Fr. Hermes, S.J. also spoke on Tuesday about additional elements being added to the chapel as it completes construction soon, including stained glass above the choir loft on the west side.) Phase II will include a new Performing Arts Center. Following a year of planning and two years of construction, the chapel represents one of the great landmarks in Jesuit High School's history. At 13,000-square feet (and 126-feet high to the top of the gold leaf-covered cross above the cupola), it has allowed Jesuit to expand the student body. Its predecessor, St. Anthony's Chapel, served Jesuit for 55 years and had a capacity of a little under than 700. This fall for the first time, Jesuit will begin a school year with 800 students, who will all fit comfortably into the chapel every morning for daily Convocation. 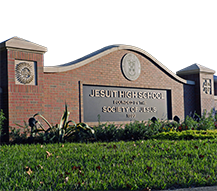 Tuesday marked the debut of the organ at Jesuit. Played by Jesuit's first Zipoli Scholar, Jordan Vivero '18, the Phoenix Organ provides a traditional, sacred soundtrack to Mass and other chapel events. The choir and chamber orchestra, led by Dominick DiCarlo and Nina Wegmann, were praised by all afterward for their inspiring performance. The five evocative chapel paintings by Berzosa include the "Vision at La Storta" behind the main altar. While on his journey from Venice to Rome in 1537, St. Ignatius, the founder of the Jesuit Order, and his companions paused at a small church, where Ignatius saw God the Father together with Jesus who was carrying his cross. Ignatius then heard the words "I will be favorable to you in Rome." The Jesuit Order was approved by Pope Paul III in Rome in 1540. The four corners of the chapel are occupied by breathtaking sacred side shrines, each dedicated to a Jesuit martyr and featuring the vivid work of Berzosa, depicting them when they were martyred: St. Edmund Campion, S.J., 1581 at Tyburn in England; French missionary St. Isaac Jogues, S.J., 1646 at Auriesville, New York; St. Paul Miki, S.J., 1597 in Nagasaki, Japan; and Bl. Miguel Pro, S.J., 1927 in Mexico. In front of the chapel on each side of the entrance is a statue, of St. Ignatius to the left and of St. Francis Xavier, S.J. to the right. Both were created by Swanson, who also made the Stations of the Cross that circle the chapel's interior. All of the chapel marble is from Italy (it was selected during a visit to Italy by Fr. Hermes, S.J. ), and the brilliant stained glass on the east side is from Conrad Schmitt Studios in Wisconsin. After the Mass ended, there was a reception on the east side of the chapel in the Student Commons. The dedication of Jesuit High School's new student chapel, the Chapel of the Holy Cross, marks an important milestone in school history. 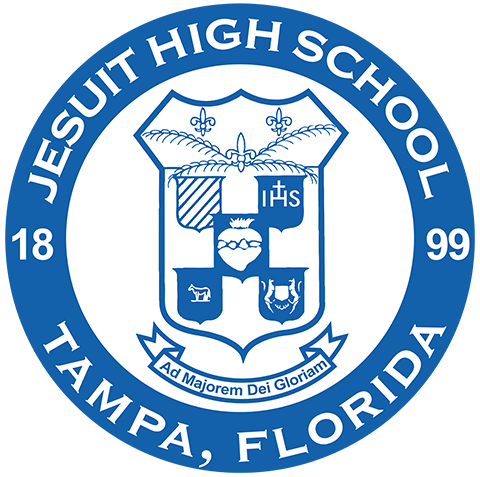 It is the fourth Chapel or Church to serve the Jesuit students in Tampa, preceded by St. Louis Church (1899-1905), Sacred Heart Church (1905-1962), and St. Anthony's Chapel (1962-2016). The new chapel, named in honor of the Holy Cross, draws from the spirit that animated the origin of the Society of Jesus. In the Formula of the Institute, the founding document of the Jesuit Order (1540), St. Ignatius refers to those wishing to be members of this new Order as soldiers of God "under the banner of the cross" (sub crucis vexillo), serving the Lord alone and the Church, his spouse, under the Roman Pontiff. Thus, St. Ignatius puts the whole Jesuit mission under the standard of the cross. These words from the Formula can be seen inscribed on the statue of St. Ignatius that adorns the façade of Holy Cross Chapel. In addition, the central interior image that confronts the visitor to our new chapel, the painting placed above the high altar, is the famous image of St. Ignatius's vision at La Storta. In this vision, St. Ignatius is placed by God the Father beneath Christ who carries the cross. From that moment, St. Ignatius knows that he and his companions will be linked intimately in name and mission with the Lord Jesus and His holy cross. Jesuit's new student chapel has found an architect in Duncan Stroik who is supremely fluent in this idiom of Catholic faith, tradition, and the liturgical worship of God. For nearly thirty years, Professor Stroik has taught architecture at the University of Notre Dame. He has been a national leader in the recovery of the classical Catholic tradition in ecclesiastical architecture. His masterful design of Holy Cross Chapel, a sacred edifice that evokes the tradition of the Italian Renaissance, will serve, inspire, and instruct thousands of Jesuit Tigers in the coming generations. The simple brick exterior, with its Palladian Doric portico and four "thermal" windows, references the simplicity of early Christian and Renaissance Churches in Venice and Rome. The octagonal interior echoes the polygonal shape of St. Anthony's and connects the new chapel with the tradition of pilgrim Churches and baptisteries, including the shrine at Loyola dedicated to St. Ignatius. The American classical tradition, with its emphasis on stained glass interiors, also finds an heir in the new chapel. The many symbols, inscriptions, altars, and artwork reflect the great contribution of the Jesuit order to the history of sacred art. They remind us of the pedagogical function of ecclesiastical architecture, a function that complements and enhances the primary function of divine worship. The pedagogical instruction that the Chapel of the Holy Cross imparts to all who worship here is that God's love for mankind is ultimately cruciform. We, in turn, render him proper gratitude by the beauty of our own worship, most especially the spiritual worship of conforming our lives to the sacrificial love of Christ's cross. 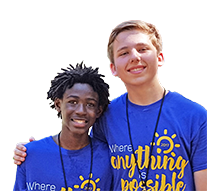 Our prayer is that many future generations of Jesuit students may be formed as disciples of Jesus Christ and his holy cross by their daily prayer in this house of God that we dedicate today.